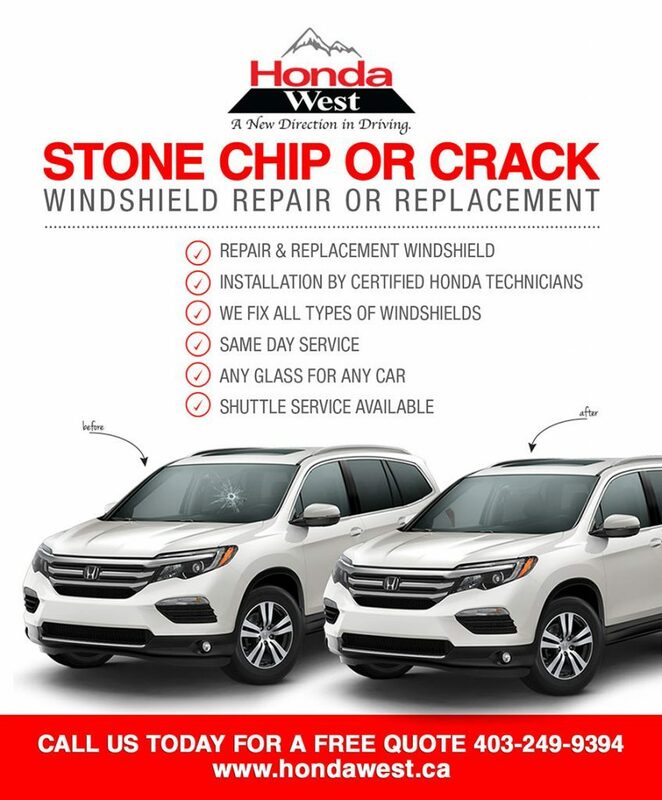 Honda West now offers windshield repair or replacement. CRACKED OR CHIPPED WINDSHIELD – WE HAVE YOU COVERED! It’s finally summer and time to take a look at the health of your windshield and ensure it is undamaged and functioning properly. If your vehicle has a cracked or chipped windshield Honda West can help. We offer in-house glass replacement and chip repair. You can schedule windshield and glass replacement with your next Service visit. Most standard Honda windshield glass can be replaced for as little as $250*. We repair chips too for $24.95 for the first chip and $12.49 for each additional chip. Did you know your vehicle’s window plays a part in your driving safety! Here are 4 ways your windshield helps keep you safe. Your windshield helps you see the road! Chips and cracks can obstruct vision and create difficulty seeing the road in harsh lighting conditions (bright sun and glare or low light). Your windshield helps your airbags deploy properly. In the event of a crash your windshield helps reduce impact and keep passengers in the vehicle. Your windshield helps increase and maintain the structural integrity of the vehicle. *non-heated windows and windows without accessories.